Senninger 20 Series Plastic Impact Sprinklers are a reliable but economical choice for smaller sprinkler systems. These 360° sprinklers are available in several trajectory options for just about any application. The great thing about the Senninger Series impact sprinklers is the interchangeable Hand-Tight nozzles. 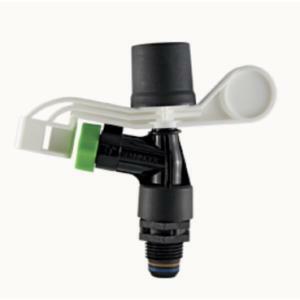 Instead of having to replace the entire sprinkler you can select from several Hand-Tight nozzle sizes to fit your system needs. * Please note: Sprinkler performance may vary with actual field conditions. Minimum recommended riser height is 1.5'.